While I was riding out to California to visit my brother a few years back, I spotted a beautiful mural painted on the wall of a building. I was amazed at the quality of the artwork and the fact that it was just out there for all of us to enjoy. 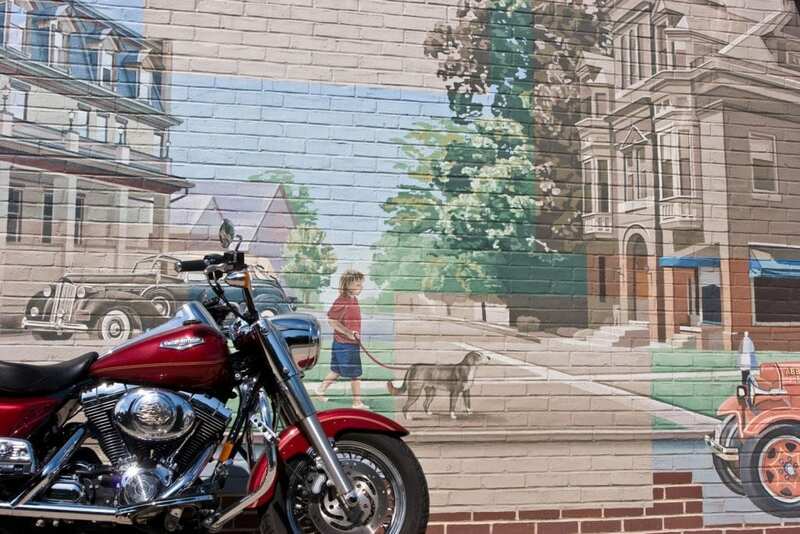 The parking lot extended right up to the mural, so I wheeled my bike up next to it and took a photo. Since I stay off the highways for the most part when I ride, I came across several more in my travels west. I shot another photo at each one and now I’ve got an interesting collection. It turns out that we have a lot of talented artists in our country and apparently a lot of suitably blank walls. I’d like to share this collection of unique photos, so here’s the deal: I’ll post one mural and let you guess where it’s located. First person to write in with the correct town and road wins a signed set of all three Road King Chronicles books. If the contest goes on for too long without a winner, I’ll post a clue or two. After the winner has been awarded their prize and the location announced for everyone, I’ll put up the next mural/motorcycle photo.